long day awaits the hiker, and an early departure is highly recommended. The morning begins with the descent from the Gasthaus Jocher to the quaint mountain hamlet of Pawigl. 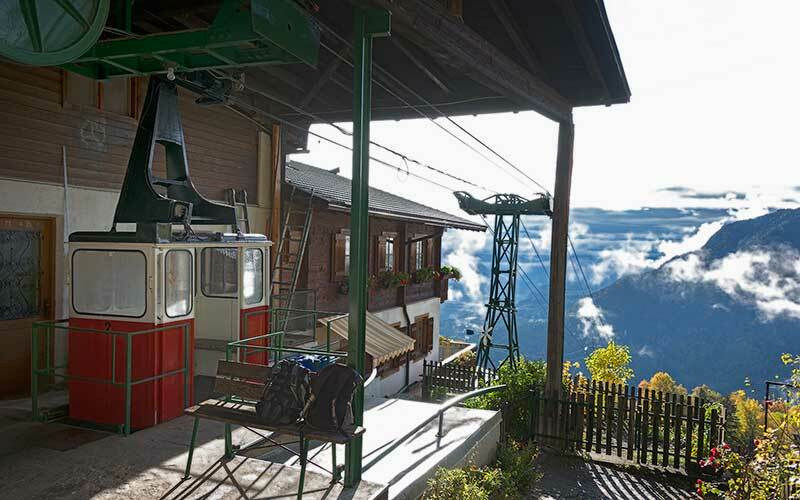 With the small private retro tram hikers are able to descend without being forced to look at a timetable down to the main road leading into the Ulten valley. A small sign at the top station of the retro tram provides instructions on how to handle the private tram system. At the ring of the bell, there will be consideration for an extra run for at least two people. But more often than not the female engineer will close both eyes and kindly ferry even a solo hiker from the steep hillside down to the valley. Near the bottom station out on the main road there is a bus stop. The scheduled bus will transport one in 15 minutes to St. Pankraz, the first village in the Ulten valley. From the village one journeys down in the direction of the riverbed of the Falschauer River. There the Ultner Talweg is followed to the location on the opposite side where a long and steep ascent commences. The trail leading from the riverbed up through the steep forest to the first farm is a rugged, almost mystical climb, and the remaining part of the trail leads through a relatively untouched and very quiet area. During the climb the view offers many glimpses of the Zoggler Lake, a dam in the middle of the valley, and in the valley corner one can see the ice-covered mountains of the Ortlergroup. From the Platzerer Jöchl, a wider pass, the hike leads leisurely in the direction of Gampenpass. Unfortunately, the last 1.5 km toward the pass follow a busy asphalt road with no alternative. Where the trail encounters the pass road, there is a bus stop. The scheduled bus runs a couple of times a day and drives over the Gampenpass all the way to the village of Unser Liebe Frau im Walde, which is the finish point for this day. A hiker who is already tired or who would prefer to avoid the asphalt is well advised to take the bus. The road must be followed a little way from the Gampenpass to a right turn onto the so-called Besinnungsweg (contemplation trail), which descends to the small place of pilgrimage Unser Liebe Frau im Wald. From the Gasthaus Jocher (1770 m) hike shortly downhill to the unimposing passage called Vigiljoch (1750 m) and follow the signs to Bärenbad Alm (trail marker 2). This leads to a forestry road which heads to the Alm; turn left and follow the road downhill. After two switchbacks and in a shallow left corner is the turnoff to the hamlet of Pawigl (signs – trail marker 34A). The trail leads sometimes steeply down to the top station of the Pawigl tram. Use the tram to get down to the main valley and briefly follow the asphalt road to the main provincial road going into the Ulten Valley. There is a bus station. The scheduled bus runs to the village of St. Pankraz (730 m). Exit at the small fire station. Follow the provincial road in the direction of the valley corner, passing a tunnel. Turn left directly after the tunnel (sign Völlan – trail marker 27) and follow the path to a small hut where the trail divides. 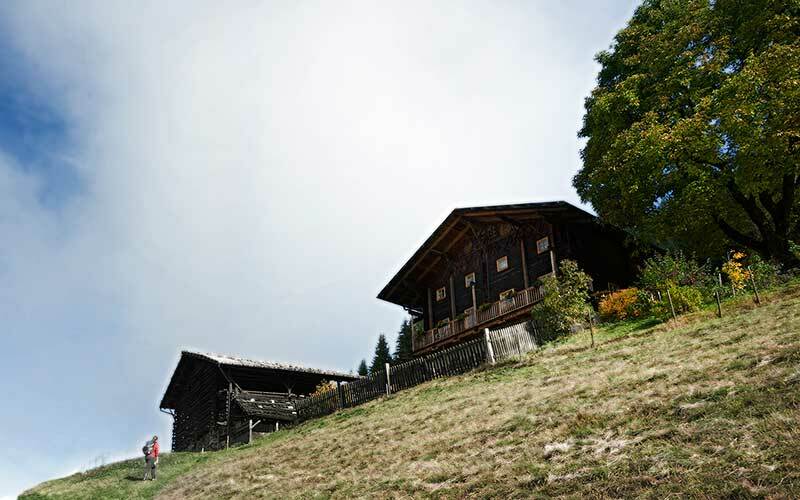 Continue hiking into the valley (trail marker 25 – Ultner Talweg), cross the wooden bridge at the sewage treatment plant and walk along a comfortable forestry road to the sports ground of St. Pankraz. Follow the asphalt road for a short while, until the steep and well marked ascent Nr. 25 to the Platzerer Jöchl branches off to the left. Walk uphill along the steep and narrow path; on a couple of occasions this path converges with the asphalt access farm road. At a farm the asphalt road ends and the well-marked trail leads along meadows and through the forest to the next farm (approx. 370 meters uphill from the start of the path). Cross between the farm buildings to reach an asphalt road again. Follow the road for about 100 meters to the next farm, called Schweighof. Here the trail to the Platzerer Jöchl branches off on the right (sign “Platzerer Jöchl” – trail marker 25). Ascend through the forest and along meadows to the next farm. Briefly follow the farm access road to the next fork, then turn right (trail marker 25). This is the way to the farm Pfrollen (1410 m), a small farm restaurant where a good rest is offered and available. The well-marked trail leads to the Platzerer Jöchl (1548 m). From there follow the signage to Platzers (trail marker 10) and then follow the indications toward Gampenpass (trail marker 11A and 1- Gampenpass). This takes the hiker to the main pass road SS 238. There is a bus stop a little way up the road. Follow the relatively busy road to the Gampenpass (1518 m) and a little longer down the other side to the turn off (right side – signs) to the village of Unser Liebe Frau im Walde (1352 m). Terrain: 2.4 km Asphalt and 14.9 km forest- and meadow trails, path, forestry road.